This is one of our Budget series of posts to give you an idea of how much we spent traveling around the world. Here we will look at Turkey. Check our posts to see what kind of activities we did and where we stayed! *Note: We are writing this budget post for the time we spent in Turkey after the visit from Della’s family. This budget does not include what we spent with them. Keep in mind, on that note, that it does not include some of the most famous tourist attractions in Turkey. 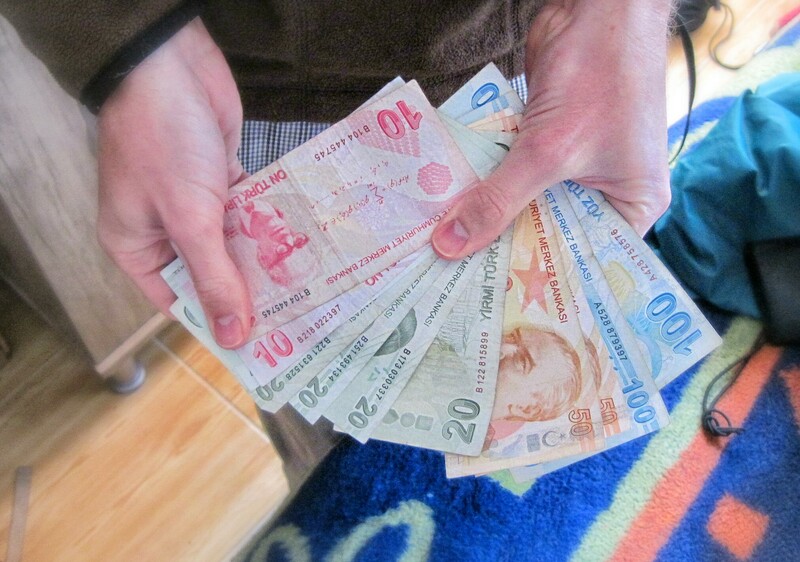 In Turkey we used the lira. We converted to US dollars using the current conversion rates at the time of our visit. It was approximately 1 lira to 0.44 dollars. We stayed in several pensions, one hostel in a dorm, and an airbnb apartment. This included entrances to a few sites, a couple of museums, and a Turkish hamam. This includes wine and beer purchased mostly at corner markets and grocery stores. Alcohol was relatively expensive in Turkey and not as easy to find as several of the other countries we visited. We did not do a lot of cooking in Turkey except in Istanbul. We normally ate out once to twice a day. Luckily, breakfasts were almost always included with our accommodation. This is high for our miscellaneous costs. It included some souvenirs and Christmas gifts. We bought much more than we might have because we knew we were returning to the USA for the holidays so we weren’t as worried about buying things. This included many buses and even a plane ticket! It was so nice to be back in a place where transportation was affordable! Turkey was one of the few countries that required a visa purchased in advance. It was easy though, just an online purchase! This divides out to $76.08/day which is under our $100/day budget. However, it does not include the bigger tourist site attractions that we did with Della’s family during our first stay in Istanbul. *We chose not to include the time spent with families in our country budget because it becomes harder to give an accurate version of how much it costs to visit the area. First, we are more than a couple so accommodation prices change a bit. We also end up traveling a bit faster when we are with them so we spend a bit more than we might chose to if we were traveling alone. In addition, our parents sometimes play the “parent card” and cover expenses that we would have paid for ourselves, so it just gets complicated! However, when we update our overall expenses and complete average per day of the whole trip we will include absolutely everything we’ve spent.